India ranks at 12th position in terms of power generation from nuclear source as per data published in May 2015, by Power Reactor Information System (PRIS) of International Atomic Energy Agency (IAEA). 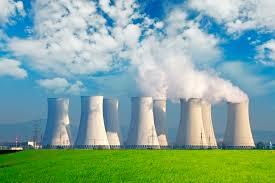 However, it stood at 6th position in terms of number of reactors in operation country- wise, globally. The current installed nuclear power capacity is 5780 MW, which is expected to increase to 10080 MW on progressive completion of projects under commissioning/ construction by 2019. The Government has accorded financial sanction and administrative approval for Gorakhpur Haryana Anu Vidyut Pariyojana (GHAVP) Units – 1&2 (2X700 MW) and Kudankulam Units- 3&4 (2X1000 MW) with a total capacity of 3400 MW. These projects are being prepared for launch in the current year. In addition, one Prototype Fast Breeder Reactor of 500 MW capacity at Kalpakkam, Tamil Nadu is at advanced stage of commissioning. Construction of two more Fast Breeder Reactors (FBR 1&2) of 600 MW capacity each at Kalpakkam, Tamil Nadu is also planned. More nuclear power projects based both on indigenous technologies and with international cooperation are planned in future. India has signed Nuclear agreements with USA, France, Russia, Namibia, Mongolia, Republic of Korea, Argentine Republic, United Kingdom, Republic of Kazakhstan, Canada, Sri Lanka and Australia. India is open to negotiation with other friendly countries who seem to have potential to make contribution to India’s nuclear energy programme.